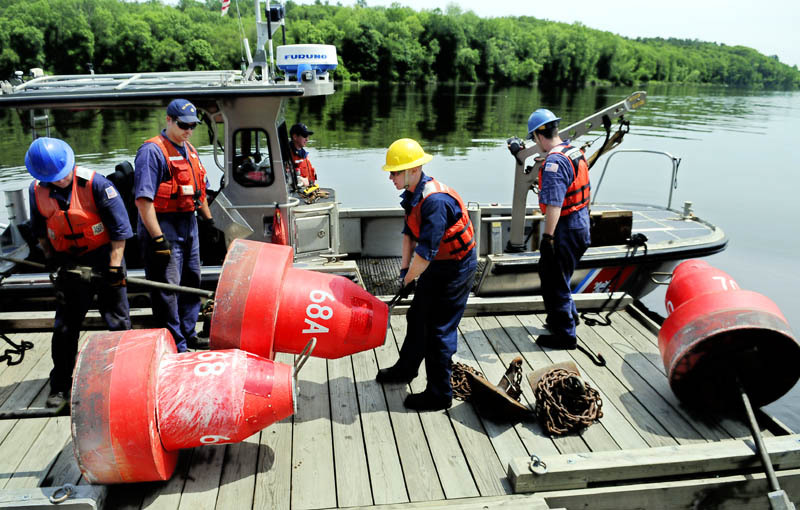 U.S. Coast Guardsmen unload buoys Thursday at the Hallowell boat landing on the Kennebec River. The crew from the Coast Guard's Aids to Navigation station in Portland reset multiple buoys that were displaced by recent high water in the river. U.S. Coast Guardsmen unload buoys Thursday at the Hallowell boat landing on the Kennebec River. The crew from the Coast Guard’s Aids to Navigation station in Portland reset multiple buoys that were displaced by recent high water in the river.